You would be surprised how many stand failures could be solved by following basic proper planting procedures. Let’s just say they’re in the majority. Proper protocol means paying attention to seed depth, rate, and date, and above all making sure the seed makes contact with the soil. With small-seeded crops in particular (these crops often can’t be planted deep enough to reach moisture), we can’t emphasize enough the need to pack soil to create a firm seedbed before establishment, as well as packing after to firm seed into soil. If the ground is not well prepared, with the removal of trash and weeds, there is less chance of seed making contact with the soil. Soil contact is the main means for the seed to absorb water, and moisture can evaporate from seed if it’s not well firmed into the soil. Disking several times may be needed to get a suitable seedbed. Early tillage gives the rain some time to settle the loose soil. Packing with a cultimulcher after disking firms soil and reduces moisture loss. For no-till systems, make sure to get proper weed control prior to planting. When using a no-till drill, checking for adequate hydraulic down pressure or adding weight is the best way to cut through any soil surface residue or stubble. Broadcasting is riskier in the no-till setting, and for it to work, there has to be plenty of exposed soil (a necessity for seed to soil contact to happen), and it helps to run over the seeding with a roller. Starting with a firm seedbed is critical for small seeds. If the soil is too loose, you risk getting the seed in too deep. To be safe, it’s best to pack before planting and again after to get seed firmed into the soil. Seed that is well firmed in makes good contact with soil to maximize moisture absorption. Seeds need to absorb their weight in moisture to complete germination. If small seeds are planted too deep, they risk exhausting their energy reserves to emerge from the soil. You risk poor emergence, and if planted in the fall, seedlings that lack vigor coming out of winter. Seed size dictates much of your planting approach. Larger seeds come with more energy to help push the seed out of the ground, so they must go in deeper. Smaller seeds (alfalfas, clovers, perennial grasses, some annuals such as millet) have less fuel for emergence and have to be planted closer to the surface, usually no more than 1/2” deep. This becomes a consideration when timing the planting date. Since summers often get hot and dry and cause the soil to dry out, many of the small seeded crops are planted before then. Millet, a warm season crop, cannot be planted as late into the summer as sorghum-sudans or sudangrasses, because of the small seed size. Seed size also helps determine your seeding rate. Larger seeds have more seeds per pound, which means you need more pounds per acre. Seeding rate is determined by an additional host of factors as well. Increase seeding rate to make up for conditions such as high-residue no-till situations or later than ideal planting dates. Seeding rates will also need to be higher for forage seedings than cover crop use – often at least one-third more. Don’t forget that adjusting seeding rate is just one tool to accomplish a variety of goals, and not necessarily a predictor of yield. Even if an increased rate doesn’t boost yield, it can help with weed control, for example, because plant population is denser from the start to outcompete weeds. Some crops, like small grains, tiller and fill in when they are planted at lower rates, so under good conditions and in the proper planting window, increasing their seeding rate beyond a certain level likely won’t pay off. Soil test and apply fertility before tillage. Lime should ideally be applied 6-12 months in advance, and incorporation leads to much greater effectiveness. Control perennial weeds prior to land preparation. Use the appropriate non-residual herbicide. Make sure you have the right mixture or species for your soil type (droughty, wet, etc. ), livestock, marketing needs, and harvest management. Choose the ideal seeding time for your region and the crop. Late winter/early spring or late summer is usually ideal. Calibrate seeder for appropriate rate and depth. King’s AgriSeeds has a calibration chart available for help with this. Finally check the progress 1-2 weeks post planting. If soil crusting or other issues like pest pressure are evident, early intervention is critical. Continue regular scouting. We do not want to be surprised by a problem, we want to know about it up front – and the sooner you find it, the sooner your seed rep or crop consultant can help recommend a solution. Reclaiming land to put into production is a multistep process. You have a valuable resource at your fingertips, but you have to be able to harness its potential and manage it to your advantage. If the land was forest or meadow for many years, it’s likely to be rich in organic matter and both above and below ground biodiversity. The most likely points of weakness, though, will be soil acidity and perennial weed pressure. Depending on how woody the prior vegetation was, you may also need to contend with shrub, tree and stump removal and using tillage to get soil to the point where it’s a clean, even seedbed. Even after rounds of full tillage, disking and herbicides, the first crop you establish should not be a fragile species – don’t invest in a slow-starting, small seeded perennial, for example. The best bet will be a quick growing annual that will offer rapid canopy closure and tolerate less-than-ideal soil conditions (which is what you’re likely to have for the first season or two), while still building up soil. In other words, a solid transition crop. Even if you plan to keep some of the trees and shrubs to build a silvopasture, you will likely need to cull some trees. Stump removal is a process all its own, and there are a variety of ways to go about it. It will be necessary if you plan to run equipment over the land. Age and size of the trees determine how difficult the removal will be. There are a few options for accomplishing this. You can rent a grinder to grind the stump down yourself (be sure to use protective goggles). Grind down about 4 inches in one spot, and move the grinder and repeat this until the stump surface is leveled off below ground. To maximize root growth of your new seeding, it’s best to grind it down to 12-16 inches below the soil surface and fill with topsoil. There are some alternative techniques out there as well. One is to burn the stump out. Drill holes about 8 inches deep into the top of the stump, clean out debris, and sprinkle potassium nitrate into each hole. Pour hot water into each hole. Pile scrap wood on top of the stump, light the scrap wood, and wait for it to ignite. Use a shovel to break up any large roots that are left over after the stump burns out. If you have a longer time to wait for decomposition, you can simply opt to cover the stump with fertilizer, soil, and/or mulch, which will foster bacteria and fungi that cause decay. Once the stump becomes soft and mulchy, it can be dug out more easily. Fill the hole left by the stump with topsoil as needed. It’s important to fill it a few inches above ground level, as air pockets in added soil and leftover wood fragments will cause soil to settle into the hole. It can help to compact the added soil after every 2-4 inches added. Be sure to remove as many of the wood chips from the area as possible after the stump has been removed. Woody material takes a long time to break down, and with its high carbon content can tie up valuable nitrogen that you will need to get the crop established. Applying nitrogen fertilizer to the area occupied by the stump can help speed decomposition. Whenever you remove the vegetation from an area, you run the risk of increasing nutrient leaching and pollution of groundwater and streams, a process that also robs your ground of its quality and nutrients. It’s important to give some thought to how dramatically the land-clearing process alters the ecosystem and potentially affects the watershed, and plan to offset this at least a little bit. Excess nutrients from lawns and farm fields are one of the largest sources of non-point pollution to waterways. One of the most critical services trees provide is water management. Trees capture, filter, and retain excess water and the contaminants that are often transported with it. Removing vegetation also creates more opportunity for lateral flow across the surface and runoff – funneling pollutants into waterways and leading to stream sedimentation, stream bank erosion and stream widening, loss of fish habitat and decline in water quality. The leafy canopy in wooded areas slows the fall of rainwater and distributes the rainfall more evenly over the forest floor. The forest floor in turn is rich in organic matter and rotting wood, and behaves like an absorbent sponge. The mean soil infiltration rate in a forested area has been observed to drop from 12 inches per hour to about 4 inches per hour when converted to turf. Consider also that a mature evergreen can intercept 4,000 gallons of water per year. Trees also consume stormwater and many of the harmful pollutants and contaminants it picks up. One of the most important services forests contribute to a watershed is cleaner drinking water. Other ecosystem services include carbon sequestration (helping remediate excess carbon pollution in the air), flood control, wildlife habitat, and forest products. So how do we keep the watershed happy when renovating land? Although some tillage will likely be needed to start fresh with the field, keep it planted in living cover as soon as possible. We recommend annual mixes in the intermediate stages before the land is ready for permanent pasture. Take advantage of fast growing summer species such as cowpeas, sorghum, sorghum-sudan, and buckwheat: fall crops like oats, radish, and other brassicas, and winter annual mixes that include triticale, annual ryegrass, hairy vetch, and winter peas. Establishing a mix, even a simple 2-3 species one, provides root diversity – different roots that take up different nutrients from various soil regions. Looking at deep- and extensive rooted crops, whether they have a large taproot or a complex fibrous root system, will help in building soil, uptaking nutrients and water, and replacing some of the role once played by trees. Also be sure that you are planting or maintaining the required riparian buffers (according to your state regulations) between your new fields and any waterways. Restoring and adding to native species plantings and additional wooded areas surrounding these fields can also help. Farmscaping select buffer areas with perennial pollinator mixes can help you play double duty with soil building and attracting beneficial insects to adjoining fields. Don’t underestimate the importance of controlling the native vegetation before planting. You will not be able to go into this field full “organic no-till”. If you have a grassy area where woody plants were removed, the tenacious perennial vegetation probably has formed a dense sod that will be naturally inhospitable to new plantings and has to be carefully controlled before any seeds go in, either with burndown or full inversion tillage. Otherwise, it can bounce back and compete heavily with new seedlings. If you still have some weed pressure even after your control measures, keep in mind that annuals you plant are much faster out of the ground and therefore more competitive against weed pressure. Sheep and goats can help with clearing shrubs and trees. Goats kill trees by girdling them, and their browsing habits lead them to eat more woody plants and bushy, small trees. Pigs can root up problem vegetation if left to an area long enough, and can also help with tilling in grass seed. Most animals can be used to “hoof in” seed in bare or wet areas, but be sure to remove animals before soil is damaged. Mob grazing of the area with cattle or other livestock can help correct any weed problems, since it leaves them little opportunity to select the most palatable species, but be sure you are using the right class of animal to graze down this less-than-optimal quality forage. What do you do when you find that your major obstacle on your newly cleared land is low pH? Aside from spreading lime as soon as possible, there are a variety of acid-tolerant cropping options out there. But it’s important to understand the effect of pH on soils, and the effect of your management on pH. Acidity itself does not harm plant growth, but it creates conditions in soil that make it more difficult for plants to perform at their best. All pasture species can grow at pH 6.5. Most forage crops prefer slightly acidic soils, but soil that falls below the optimum range can have serious consequences that include decreased soil nutrient availability, increased impact of toxic elements in soil, diminished microbial functions like nutrient cycling and nitrogen fixation, and overall reduced plant uptake of water and nutrients. Raising the pH limits the solubility of toxic elements in soil, such as aluminum, hydrogen, and manganese. Below 5.5, soluble aluminum can reach levels toxic to plants, and below pH 5.2, manganese can become toxic. The combination of increased toxicity of aluminum and manganese and the lower nutrient availability at low pH harms soil microbes and lowers the biological activity level in soils. On the flip side, above pH 7.5, most micronutrients won’t be available to plants. Keep in mind also that both N fertilization and crop harvest have acidifying effects, so soil testing (and probably liming) will be an ongoing process. Crops uptake basic elements during their growth – calcium, magnesium, and potassium – and these lime-like (basic) materials are removed from the field when hay or grain is harvested. Once you apply lime, it will take at least a year for it to take effect in the soil. For neutralization to happen, there needs to be a reaction between lime and soil particles, which is greatly enhanced by incorporating the lime (otherwise lime moves down through the soil profile at the rate of about 0.5 – 1 cm per year). In the meantime, emphasize acid-tolerant crops. Many cool season perennial grasses tolerate acid conditions well, especially tall fescue, Kentucky bluegrass and reed canarygrass. Some legumes do better than others. In general, lower pH inhibits microbial activity, which includes nitrogen-fixing rhizobium bacteria. Legumes also tend to rely on more basic elements from the soil, such as calcium, magnesium, and potassium. Good legumes to try on more acid soils include cowpeas, lespedeza, hairy vetch, white clover, and alsike clover. Annuals like crabgrass, millets, oats, and triticale can tolerate pH of down to 5.5, and rye can go down to 5.0. Choose the species that are best for your goals based on winter hardiness, drainage, pH, fertility, and harvest management plans. The first few seasons you will want to rotate with annuals, taking advantage of their short lifecycles and fast growth. Don’t just look at your cover crop, use it! Pea-oat mix is a simple but effective soil renovator for early spring or late summer. An Oats-Daikon radish mix is also quite elegantly simple, and radish scavenges nitrogen, potassium, and phosphorus while breaking up soil compaction. Neither of these mixes can be expected to overwinter in Northern climates, but they produce several tons of dry matter in about 60 days. What other dual role can the transition crop play? Think beyond the four-legged foragers. While building soil, you can also bring in the beneficial insects with quick-growing, nectar-producing crops. Buckwheat blooms in about 40 days, attracting bees, pollinators and other beneficials, and also tolerates mildly acidic and low-fertility soils. It scavenges phosphorus, and is also an excellent soil conditioner. A mix may be even better, such as Summer Solar Mix – which contains buckwheat, cowpeas, sunflower, and sunn hemp. Each species blooms at a different time, creating a succession of blooms over the course of the season – extending the productivity window of your bee and pollinator forage. Don’t leave out legumes – peas, vetches, annual and perennial clovers, etc. – which fix nitrogen and build soil fertility. The catch is that legumes often can’t be your first line of defense on virgin land because most do not to tolerate acidic soils. The bacterial strains that colonize their roots and fix atmospheric nitrogen can’t survive in an acidic environment. There are a few exceptions, including summer annuals cowpeas and sunn hemp, and the cool season perennials birdsfoot trefoil and alsike clover. Legumes are often slightly slower starters, as well, so you will often find that you have to rely on other species in the mix (forbs and grasses) to outcompete weeds. Building soil organic matter is really the key to creating a productive field, and should be the focus of your transition time. Almost any type of crop can do this, given enough time and the right conditions, as well as a dedication to leaving some crop residue in the field – whether left as no-till surface residue or plowed under as green manure (many crops regrow after cutting or grazing, allowing you the flexibility to still get some cover crop-only growth after your harvest). Organic matter stimulates biological activity in the soil and improves a number of soil properties like moisture retention and aggregate stability. This is another reason for planning a succession of annual crops – they are high-producing in a short time, leaving several tons of dry matter in the field. Using a full rotation of annuals not only builds up organic matter but helps condition soil to the point where it’s friable enough for a fine, firm, clean seedbed where perennials can get their start. Protect it! Practice good pasture management, including rotational grazing, soil testing and regular fertilization, and mowing or clipping when needed to control weeds. When grazing, remember to take half, leave half for best regrowth. Allow paddocks to rest and recover properly, and adjust stocking rates to get more even distribution of manure and urine. Don’t forget to continue to practice pasture renovation to build the field’s resilience and biodiversity – cycle into annuals every few years, followed by reseeding. 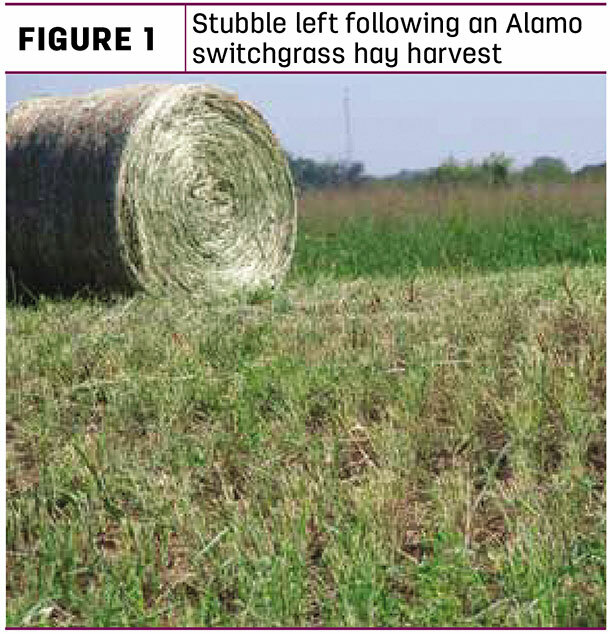 Special attention should be paid to the cutting height when harvesting switchgrass or other native warm-season grasses for forage or biomass (Figure 1 below). A target stubble height of 8 inches (minimum 6 inches) is recommended for these tall-growing grasses (see SP 731-D: “Producing Hay from Native Warm-Season Grasses in the Mid-South” for additional information on this subject). Why is cutting height important? Lower harvest heights can reduce plant vigor by removing all leaf surface area, as well as the growing point. This forces the plant to draw energy from root reserves and, at the same time, lose growth potential until adequate refoliation has occurred and photosynthesis can resume at a rate great enough to support plant growth (Figure 2 below). 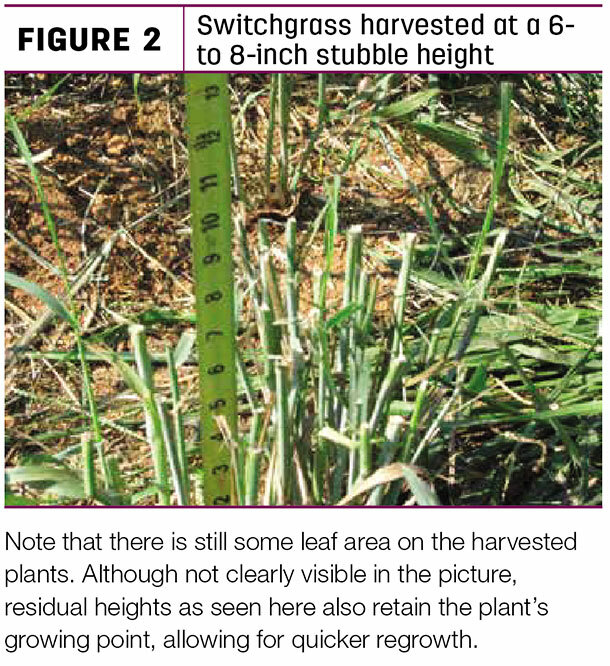 Because of these increased energy demands on the plant, maintaining adequate cutting height is especially important in management scenarios where multiple cuts are made during a single growing season. Additionally, taller stubble provides the benefit of suspending the windrow above the ground, thus increasing air flow and decreasing curing time. A second issue with low cutting heights is the stubble and potential for tire damage. In biomass production, the single annual harvest taken after a frost leaves stubble from large stems that have grown all season; this stubble, if cut at heights less than 8 inches, can be quite stiff and will not flex as tires cross it, resulting in an increased risk of tire damage. Leaving taller stubble allows for an increased angle of contact between coarse stems and tires, resulting in minimal risk of tire damage. Because hay harvests occur during summer before plants become stemmy, stubble is not coarse and tire damage is not an issue. Read more: How can I cut that high?